Nvidia has finished its special presentation at CES 2016. The whole event centred upon the AI solutions the green team are offering to the automobile industry. As you might guess, it had to do with putting Nvidia processors in cars to power self-driving. 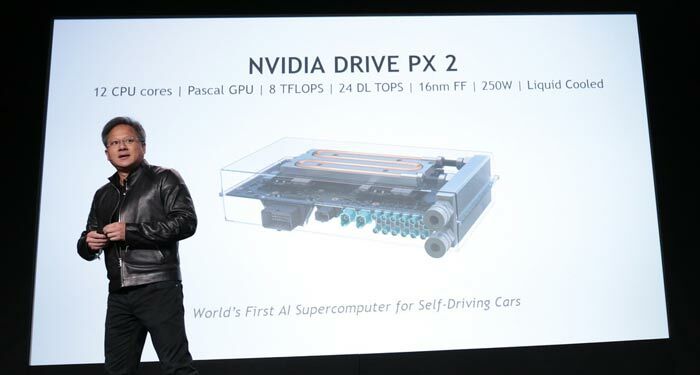 With that business goal in mind Nvidia took the wraps off its DRIVE PX 2 in-car 'supercomputer', and the twin supporting acts of Nvidia DriveWorks software and Nvidia DRIVENET neural net for deep learning. Nvidia's DRIVE PX 2 is a powerful computer that fits in the boot of your car to power its AI capabilities and other tech such as in-car entertainment systems. The platform already sounds like a success as Nvidia says it has partners such as Audi, BMW, Ford, Mercedes-Benz and Volvo lined up, with more being arranged. Nvidia says that DRIVE PX 2 is more than just a bolt-on for a car - it is "an end-to-end solution for deep learning that includes a wide variety of tools and technologies". The hardware sounds impressive and Nvidia has some impressive claims to highlight the processing power on offer. It says that DRIVE PX 2 provides supercomputer-class performance — up to 24 trillion operations per second for artificial intelligence applications. The new in-car 'supercomputer' is ten times faster than the first generation that was made and "has the processing power of 150 MacBook Pros" according to today's CES 2016 presentation. Slides shown at the presentation provided the outline technical specification of DRIVE PX 2, and as you can see above, it was compared to the Titan X. Now let's move on to Nvidia DriveWorks and DRIVENET supporting technologies. DriveWorks software "provides the pipeline for running perception, localization, planning and visualization". So basically it is the software that takes in all the data from the in-car sensors and interfaces with DIRRVE PX 2 so the computer can make intelligent decisions about driving. 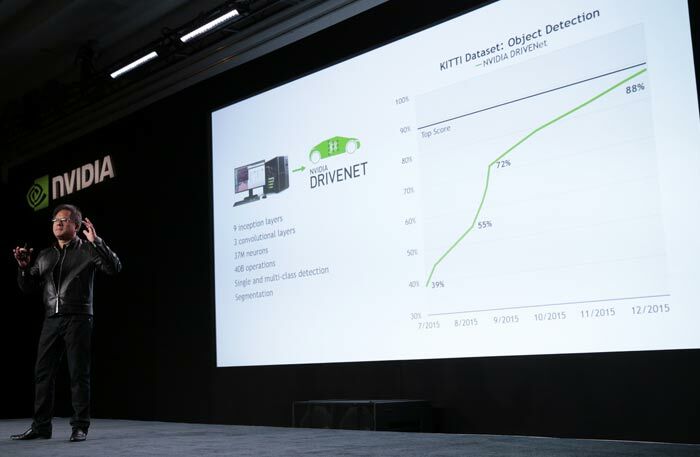 DRIVENET is a deep neural net designed by Nvidia to help train cars ready to cope with most of the things/events they will encounter from day to day. 120 million objects are currently recognised. This provides a foundation for the car to work upon and apply intelligence to. Nvidia says that it has made great progress with DRIVENET and it is now approaching "world class levels" but beating the recognised top performer on one key aspect - it works in real-time. Volvo's Vision 2020 principle is that "no one should killed or seriously injured in a new Volvo by the year 2020," said Marcus Rothoff, director of the Autonomous Driving Program at Volvo Cars. "Nvidia's high-performance and responsive automotive platform is an important step towards our vision and perfect for our autonomous drive program and the Drive Me project," he added. AMD won all the Apple discrete GPU contracts for this year - confirmed. (Sorry Nvidia that Sony/Apple/Samsung/Microsoft have left you). Some Tesla fans are saying “unlike Audi self-driving car that uses the nvidia AI processor that relies only on camera to process the visual world , the Tesla Model-S uses all-in-one unit that process the visual, sonar, infrared and GPS to control the car” but this year Nvidia have moved a step ahead to introduce ARM cores which will process the sonar signals etc….. anyway I want AMD to enter the market too with their ZEN cores. “has the processing power of 150 MacBook Pros.” Nvidia is lying there…..lets take one 2015 MacPro with the following specs 4 core intel i7 with HT @ 2.8ghz (turbo to 4ghz) + AMD Radeon R9 M370X with 2GB of GDDR5. By who? That's not in the article at all.